Feel the magic of 81 winning lines and many possible winning combinations. 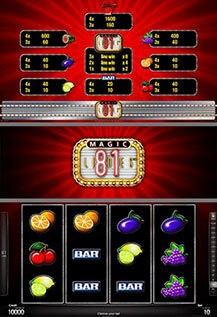 The fruit game „Magic 81™“ offers you a lot of fun and action. One highlight of the game is that you can multiply your wins with the „MAGIC 81 LINES“-Symbol (Joker). The „MAGIC 81 LINES“-Symbol replaces all symbols and can appear up to three times in the same game. Every „MAGIC 81 LINES“-symbol in a winning combination doubles the win (win x8 possible). All prizes are for combinations from left to right.